The optimist in us wants to believe that, in the event of an alien invasion, the pushback would resemble Independence Day: all of humanity putting aside their differences to defeat the common evil. The realist suspects that it will more than likely resemble the post-invasion world of Captive State: a small fraction of the privileged and powerful using their influence to turn on their own kind for favors from our new overlords, keeping a big chunk of the populace under control and complicit through propaganda and fear, while a tiny group of rebels struggle to bring the system down from within. For a fairly traditionally structured alien invasion sci-fi action/thriller, co-writer/director Rupert Wyatt’s (Rise of the Planet of the Apes) tense, airtight, passionate, engrossing allegory of systemic oppression has very little of the actual aliens in it. If I had to guess, I’d say the fairly unoriginal but admittedly frightening giant spider/porcupine creatures enjoy a maximum of five minutes of screen time within 110 minutes. Yet that’s all by design. The main antagonists who are trying to thwart the plans of a handful of resistance fighters are all human, mainly collaborators who will do anything to maintain the status quo for their personal gain. And the status quo is grim, at least for the common folk. It’s been nine years since the aliens took over the planet and installed themselves as “legislators.” In order to keep people from organizing, the legislators have outlawed all digital communication and are keeping track on every human through one of those bugs Agent Smith plugged into Neo in the first Matrix. The lack of digital tech gives Wyatt two creative sandboxes to play with, one narrative, the other stylistic. First, without the internet and the convenience of digital media, the small anti-alien “terrorist” cell has to come up with clever analog ways of stay one step ahead of the establishment. This leads to some quaint tricks, such as newspaper classifieds being used for direct communication between members who otherwise don’t even know each others’ identities. Second, the use of reel-to-reel tape, tube TVs, etc. gives Wyatt a sly excuse to have his film’s overall aesthetic harken back to the gritty, heady and politically charged sci-fi output of the ’70s. Our protagonist is Gabriel, played by Ashton Sanders from Moonlight. Like in Barry Jenkins’ masterwork, Sanders once again communicates untold depths of pain through simple body language. Gabriel’s brother Rafe (Jonathan Majors) died while conspiring against the aliens and is now considered a hero of the underground. Even though Gabriel’s disillusioned by his brother’s efforts, he gets roped back into the resistance after a voice from the past beckons him. Now Gabriel must decide if he will stand for his fellow humans and join a plot to strike a considerable blow against the aliens, or if he will tuck tail and run away. Considering the odds, it’s hard to blame Gabriel for leaning toward the second option. Wyatt’s not interested in creating a traditional hero in Gabriel, and doesn’t shy away from showing his raging inner conflict. On his tail is William (John Goodman), a cop who used to be Gabriel’s father’s partner, but is now completely sold on the alien agenda, and will do anything to maintain their power. Instead of worrying himself with grand world building, Wyatt meticulously constructs a procedural thriller about the ins and outs of the resistance fighters’ secret plan. Wyatt slowly raises the heat until we reach a nail-biting midpoint set piece in a football stadium where a unity between humans and aliens propaganda rally is taking place. The sequence sports a patient and potent Hitchcockian rise of tension and a crescendo that does not disappoint. While we don’t really get a lot of information about how the aliens specifically use propaganda and their spin machine to keep humans docile and willingly under control, Wyatt conveys a lot with the peripheral. For example, the unity rally is full of American imagery, tweaked just enough to include the aliens. Without being too on the nose or preachy, Wyatt suggests that every nation has millions of people willing to go along with anything as long as it comes draped in the familiar symbols of patriotism. The cinematography by Alex Disenhof serves as a perfect complement to Wyatt’s vision—it’s relentlessly grim, awash in browns and grays with some stark contrast. Rob Simonsen’s percussion and bass-heavy electronic score almost gives voice to the characters’ anxious heartbeats. 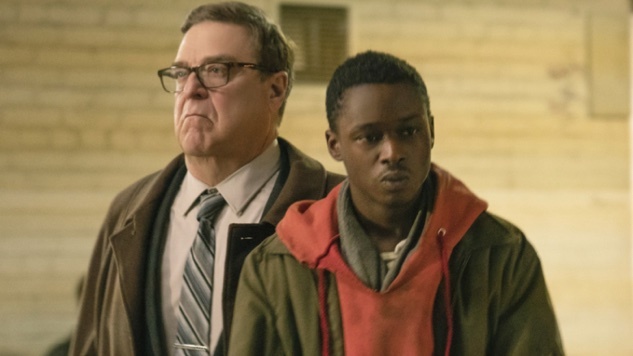 It’s a shame that its studio didn’t more heavily market Captive State. Smart, layered, tense, well-executed sci-fi like this should be nurtured in movie theaters.